There was a singularly overwhelming reason we planted the mint I talked about yesterday: Bourbon. Both The Rocket Scientist and I love bourbon. It’s definitely her dark spirit of choice. Whether I like bourbon better than a single malt (Islay, if you please, although I’m going to drink a quality whisky from any region) depends on my mood, the day, the angle of the sun, and the standing in the AL East. Straight: I’m the only one who drinks it straight, and when I do, I prefer Van Winkle Special Reserve. Blanton’s has some game, and I’m not going to pass it up if there’s no Van Winkle. With a splash of ginger ale and a small wedge of lime: This is probably our most common method of drinking it. 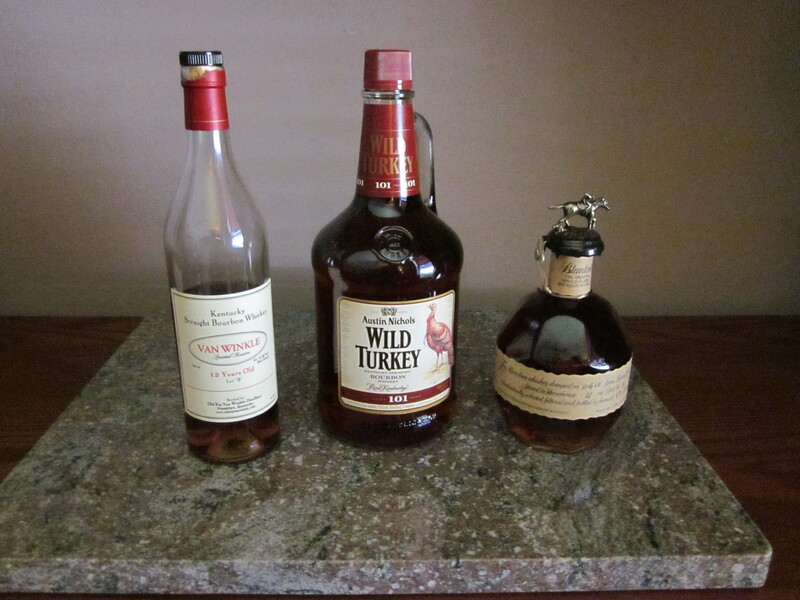 We will most often use Wild Turkey 101. It’s really not the higher alcohol content, it’s that we both think that the flavor profile is richer and deeper. 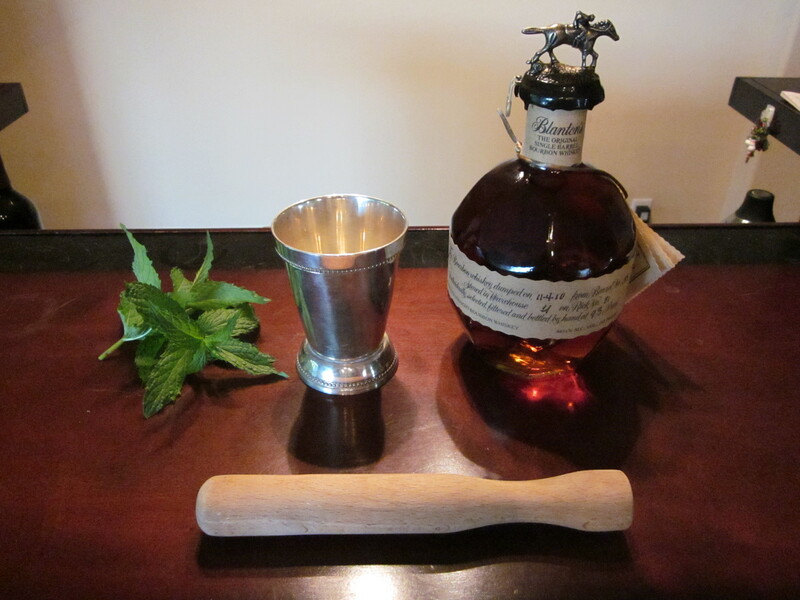 The Mint Julep: While certainly a little more time-consuming to make, this American classic cocktail fires on all cylinders every time. 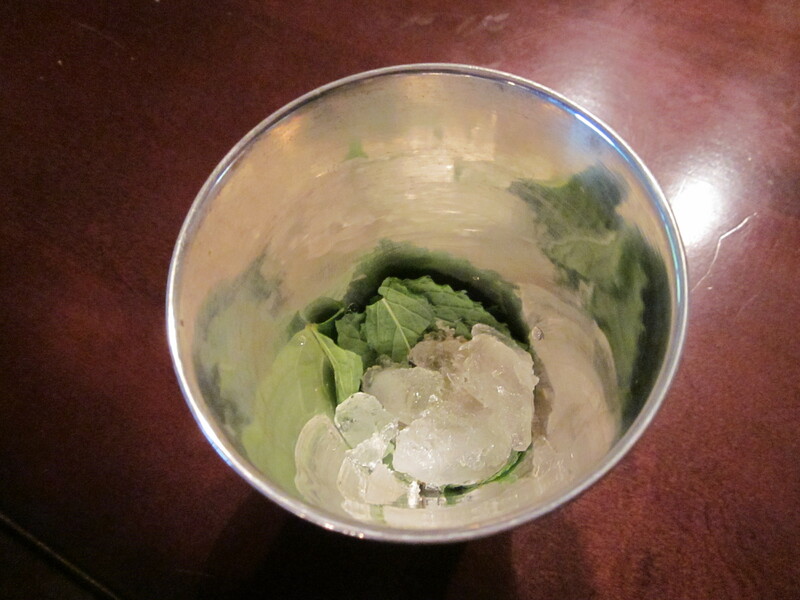 I think Blanton’s generates one fine julep. It has a little less of the wood (and accompanying vanilla flavors) in it than the Van Winkle does, leading to a better blend with the other ingredients. Blanton’s is also a fine sippin’ whiskey as well, it’s just that the more aggressive character of the Van Winkle is what I prefer when drinking it straight. We always have fresh simple syrup around the house (it blends with iced tea better than raw sugar—and hey, mint juleps!) and store it fridge in one of those squirty ketchup bottles. 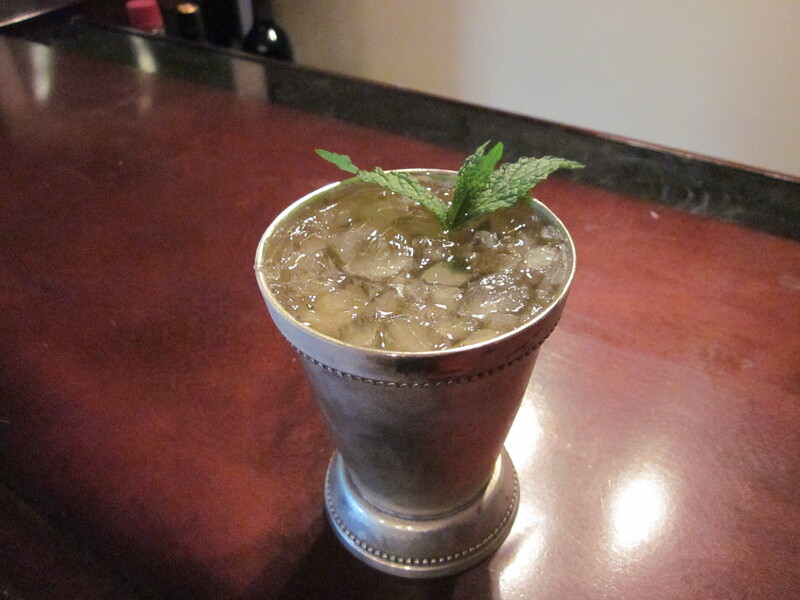 We use traditional metal julep cups, but you can use an old-fashioned glass if you like. I suppose you could also use a Collins glass if you want, but it always feels to me like dark spirits go in short glasses and light spirits go in tall ones. I’m not quite sure where I picked up that. 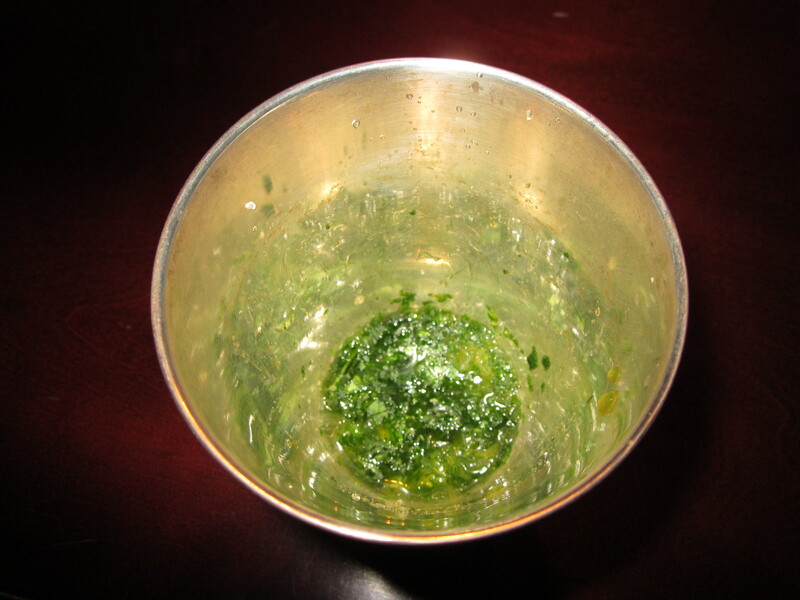 We start by putting the mint, the sugar, and a little bit of crushed ice—just enough to provide some friction–into the julep cup, and muddling it until it’s reduced to a fine pulp. We then fill the cup with the remainder of the crushed ice and fill it with the bourbon, then squirt in the simple syrup. I know there are traditionalists who say you’re not supposed to stir it (probably so you don’t get mint in your teeth when you drink it), but we like to give it a light stir to integrate the flavors a little better. I also know there are some folks (mostly from more northern climates) that like to add club soda to the drink, but that just seems all kind of wrong to me. Your mileage, of course, is welcome to vary. Finally, we garnish it a small sprig of mint, although we generally skip that step if we’re not serving them to guests—that’s all about presentation, and we’re more interested in the consumption. I’d advise sipping slowly. Taking too big of a gulp might dislodge that mint from the bottom of the cup, and although mint makes for a tasty drink, a mouthful of unwanted leaves can make for a suboptimal experience. The metal julep cups will sweat like crazy, so make sure you have coasters handy. Otherwise, find a veranda and enjoy. This entry was posted in Wine and Spirits and tagged Bourbon, Cocktails, Mint, Spirits. Bookmark the permalink.